Tires being moved by a County of Wetaskiwin Public Works operator, bound for a giant shredder in Ponoka. County of Wetaskiwin – In the world of Recycling and Waste Management, many initiatives benefit municipalities and their ratepayers. Attending conferences such as the Alberta CARE Spring Recycling Seminar that took place in Drumheller in early March is an investment of time, money and effort that many cities, towns, counties and MDs believe is critical to learning new recycling technologies. Wetaskiwin County, represented by Gary Ellison, was a participant at this latest informative gathering: “if you can bring home one valuable item from such a conference to benefit your region, and if you network actively with other communities, your investment will pay off” shared Mr. Ellison, Utilities Foreman. 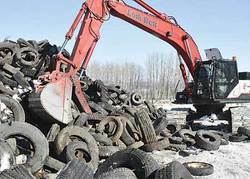 In Wetaskiwin County, a project is in the works that could lead to further use of one of the most dreaded item in landfills and junkyards: discarded tires. This large county owns 9 transfer stations where local residents can drop off their household garbage, as well as metals, tires, electronics and paints. The County then transports the garbage to the Camrose Landfill, which it shares with that county. As of recently, Wetaskiwin County has set the wheels in motion to use these tires, shredded by one of the largest shredders in the land, owned by Cutting Edge Tire Recyclers at its Ponoka plant. The County is “waiting for a grant approval to proceed with the earmarking and planning of this low-density roadway improvement project”. According to David Dextraze, manager of Public Works for Wetaskiwin County, his department “is looking forward to a summer project that would see soft roadways strengthened by the addition of a tire-related aggregate”. This component has been successfully used as a gravel supplement by other counties and local officials seem pleased that their county is jumping on the bandwagon of this fairly new technology. Melissa Minks, General Manager of Cutting Edge, was happy to confirm that “her company is dynamically presenting this technology to several interested municipalities and counties, and setting up pilot projects throughout the province”. Drumheller, AB – In a small town of Southern Alberta, an impressive contingent of municipal and county representatives gathered to learn more about environmentally responsible practices and options. Alberta CARE – the Coordinated Action for Recycling Enterprises- is a dynamic and educational group that has its headquarters in the City of Leduc under the firm and dedicated leadership of Linda McDonald and that hosts two conferences each year, in different regions of the province. These two conferences are necessary to broadcast all the latest recycling techniques and developments, as this is a field that never ceases to research and share its results with the entities that control the environment. This Alberta Spring Recycling Seminar took place in Drumheller the Feb.27-March 1st. Initially, 121 CARE members had signed up for this three-day seminar but surprisingly, the hype grew until the opening day of the conference, and eventually a total of 160 participants were registered. Plastics-to-Oil technology, presented by Stephen Mooney, P. Eng., Director of the Cold Climate Innovation (CCI) at the Yukon Research Centre. Mr. Mooney spoke on the last day of the conference and was so anticipated that conference guests stayed on-site longer to hear his presentation. – Landfill Setbacks, presented by Steve Madden of County of Grande-Prairie: this presentation was very popular as Mr. Madden is a dynamic and passionate speaker; as landfills are a concern for today’s municipalities and counties, he had his audience captivated! Three months ago, the Alberta government put together a Stakeholders Committee to discuss and act on this serious concern, and now the AAMD&C (Alberta’s association of Municipal Districts& Counties) is inviting the public and municipalities to offer them feedback and opinions. – Bio-reactor to Energy presentation by Jeff Johnston, manager of the Bio-reactor Landfill Gas-to-energy project for Aquatera Utilities in Grande-Prairie, a project that is the first of its kind in North-America. Steven Gerlitz’s “Trash-to-Treasure” presentation was well-received, as it was “well-done and humorous”. The CAO of Camrose County did not hesitate to share a story of a town office that invested heavily in a wood pellet heating system, the results being less than satisfactory: he did not ‘sugarcoat’ this attempt at environmentally-friendly progress, and received many accolades for his candor. “Edson goes solar” was a popular presentation by Gordon Howell, an electrical engineer who shared the good news that solar panels are more affordable nowadays, for both residential consumers and commercial buildings, and considered by some to be quite competitive compared to traditional electricity. Mr. Howell contributed to Edmonton’s first “net-zero-energy” houses, and is helping to make net-zero-energy housing the most cost effective option in the housing market. Catherine Klyne of Clean Gen talked about tire-related aggregates, the main product of their sister company, Cutting Edge Tire Recyclers of Edmonton and Ponoka. This concept is gathering momentum, with many municipalities and counties looking into this option to repair and strengthen soft roadways.